Made in the USA! We will make anything you can dream up. Mix beads, pick your length....let us help you. The possibilities for Custom Orders is endless! 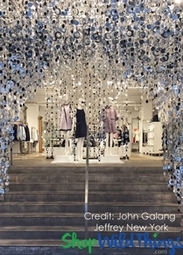 We can use Metal Frames, Fabric Tops with Metal Grommets and more. Our staff is so unbelievably helpful, you'll wish we lived next door. 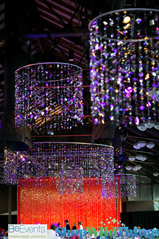 Prices for Custom Chandeliers are based on the beads and lengths chosen. Quotes are cheerfully provided via email or over the phone. There is a $150.00 Minimum for Custom Orders. 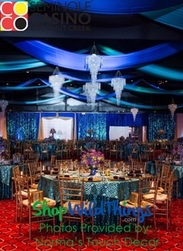 ShopWildThings has a reputation for making INCREDIBLE custom Chandeliers, Columns, Beaded Curtains and Backdrops using a variety of materials. 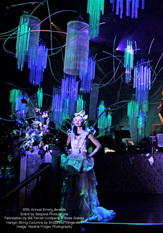 Have you ever seen event photos with huge custom crazy chandelier installations and wondered "Who did that?! "...chances are, it was ShopWildThings! Item #19185 36" Diameter, 4 Tiered Frame Holes between beads are drilled 1" apart giving room for the beads to hang without crowding. We can add one strand per hole, one strand every other hole, or use a different frame material and add even more strands! 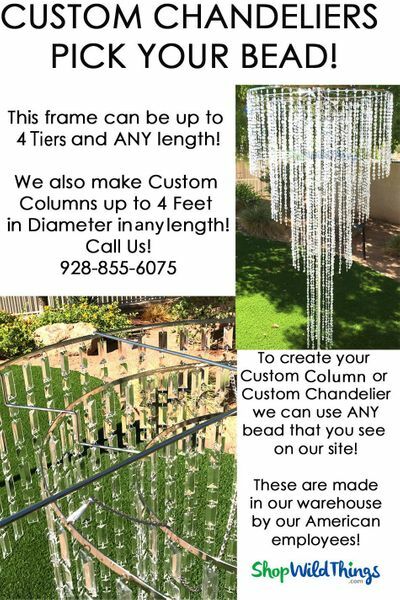 This Chandelier Frame is one option for you to choose to build a statement piece that is truly all yours in that you can choose to have us add beads in Acrylic, Glass, or Metal! This extremely strong metal frame has 4 tiers. 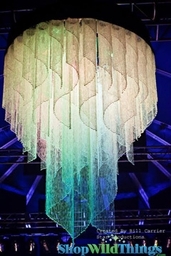 Do you need a 20 Foot Long Chandelier? This frame is a great place to start! The outside top ring is 35.75" in diameter and between 6-7" tall (the drop between tiers is about 2") with approximately 120 holes for strands of beads. It is strong can handle heavy beads, in very long lengths if needed. The second inside ring steps down by about 2" and is 26" in diameter with approximately 84 holes for strands of beads. The third inside ring steps down by 2" and is about 16" in diameter with approximately 48 holes for strands of beads. The fourth inside ring steps down by 2" and is about 7" in diameter with approximately 20 holes for strands of beads. We can fill every hole with strands of beads, we can quote you to add more holes and extra strands of beads, or even provide 1/2 density (fill every other hole) with strands of beads. 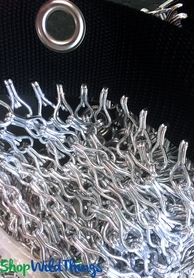 Attached to the frame is a strong hanging chain. There is an opening that is a little larger than 1.5" in diameter at the top in the center to add a light kit if you'd like. 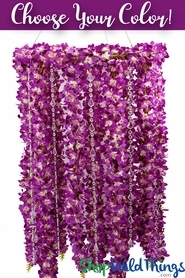 Item #19184 24" Diameter, 1 Tier FrameWe offer this 24" frame that has hanging chains and approximately 64 holes for beads. It also features a hole in the center for placing a light kit if you'd like. Holes between beads are drilled 1" apart giving room for the beads to hang without crowding. We can add one strand per hole, one strand every other hole, or use a different frame material and add even more strands. 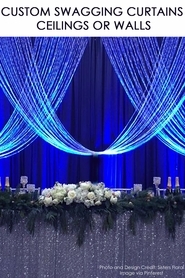 Bendable Top Curtains, Chandeliers and More We also have a TON of material to make exactly what you need for your project. 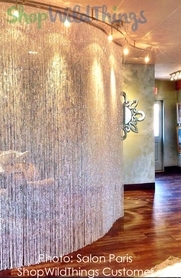 Need a 4' Metal Chandelier frame with beads hanging from it (or string curtains? )...we do that, too! 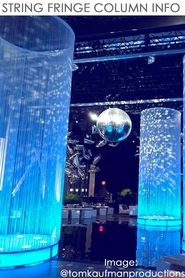 We can even make a Fabric Top curtain with metal grommets for you! 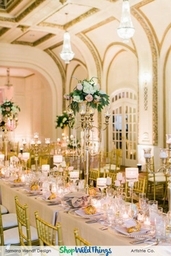 We are sorry, we are not offering chandelier frames or curtain tracks for individual sale. Parts are only sold as part of a Custom Project. 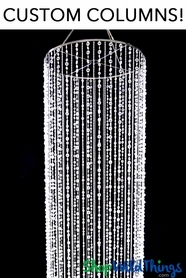 Custom Chandelier - 3 Feet Wide - 4 Large Tiers or 2' Single Tier!